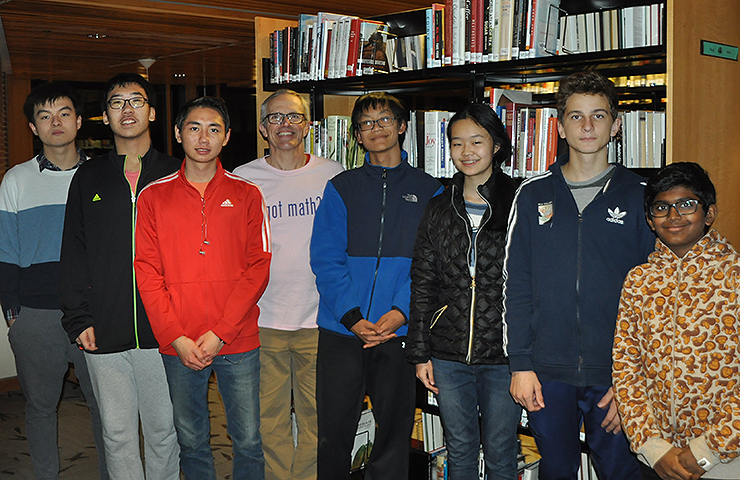 The George School math team ended their 2018 Math Madness season 7-1, ranked twentieth among the more than 550 US high schools that competed. Team members Ellen Zhang ’21 and Justin Liu ’21 ranked among the top fifty out of 10,000 students. This is the fifth year the George School math team has competed in Math Madness and they have been placed in the elite, Division I bracket every year. Other team members include Jennifer Chang ’19, Young He ’19, Milano Hu ’21, Kalvis Jatnieks ’20, Vilnis Jatnieks ’22, Ian Liu ’21, Jason Liu ’22, Leon Liu ’20, Bach Pham ’19, Pranav Sabapathi ’22, Maksim Shi ’20, Spencer Stockhammer ’20, Tony Tian ’19, John Wang ’19, Tommy Wang ’21, Anney Ye ’20, and Ben Yu ’20. The Cougars lost in Round 4 of the Bracket Challenge on November 13, 2018 to second-ranked Adlai E. Stevenson High School in Lincolnshire, Illinois. The eight schools remaining in the challenge are currently ranked among the top ten in the competition–Naperville North High School (1), Adlai E. Stevenson High School (2), Troy High School (3), Glenbrook North High School (4), Lynbrook High School (5), Stevenson School (6), Clements High School (7), and University High School (10). Math Madness is a joint initiative between American Mathematics Competitions and AreteLabs, and is one of the premiere math competition events in the United States. It is an online, team-based event that takes place each fall. More than 500 high schools from across the country compete in leagues of weekly competitions followed by a single elimination bracket tournament, styled after the March Madness basketball tournament for college teams.